The May meeting was attended by 25 members and friends. Bob Hollister led the short business meeting. Jack gave a current financial report. The club continues to meet its expenses. The previous meeting minutes were approved. The major topic of discussion was once again the upcoming summer touring and show season. The Hancock county Museum event with the Adams truck is still in the works for sometime in the middleo to end of September. 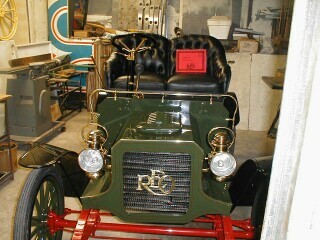 The old car event will revolve around the 1913 Adams Truck. They'd like at least 20 pre-WWII automobiles as a static display. The club has made the commitment to organize the event, with many members tentatively vowing their support. We just need a firm date to start the ball rolling. Once again this year, the committee of the Forest July 4th celebration has asked us to enter at least 5 of our cars in their parade. The parade will be held on Friday, July 8th. Cars are to meet at the school by 5:30 pm to line up for the parade. If we can get the 5 car minimum to attend, they have committed $50 to the club. The Pandora Jaycees would like to have a cruise in with all pre-WWII cars on August 13th. Many of the members think that it'd be a great idea. It helps to promote a feeling of heritage and history at the same time. The Tin Lizzy's Model T Club is hosting this year's Michigan Model T Jamboree. This Jamboree is always held the weekend before the Ohio Jamboree. If you have the time this would be a wonderful experience and a great chance to get the Old T out for some great touring through the Pah-Pah region of Michigan. The event runs August 25, 26, and 27. We once again discussed an Island tour and a one or two day tour to see a couple of car collections in Tiffin, Ohio. Both of these events will be run with a combination of the Northwest Ohio group and the Tickin' T's of Central Ohio. Here's a chance to get out there and show off what we've done with our T's. We also have the advantage of having a great wealth of knowledge between the two clubs. They can fix almost anything right on tour. This Added Event May Sound Familiar! 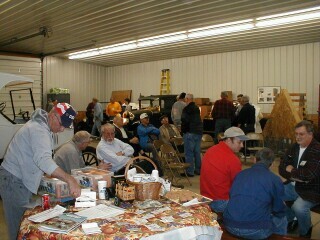 Last year we spent some amout of time planning a static car show for the Mennonite Memorial Home in Bluffton, Ohio. The plan was to show the cars to the residents and then proceed to a lunch at one of the local eateries. This never happened because, the day of the event brought the worst monsoon of the summer to the Bluffton area. We would like to once again try to beat the elements and bring a little joy to the residents at the Mennonite Home. Here's the plan so far. Go to the show (Jack will add details at the next meeting) from 10 to 12 on June 25th. Then drive to Jack and Marilyn's for a Potluck lunch. The club will provide hamburgers and hotdogs. If you can't make the next meeting, call Jack for details. collector of rare cars and many other things. They say that from an early age, he went through trash just looking for things to collect. He can look at the same table of junk that you or I would in a flea market and come up with a rare one-of-a-kind item that we'd look right over. He just has a knack for "stuff". 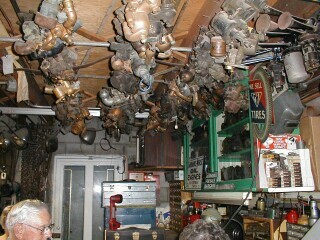 Above is a picture of his REO and another of his collection of carburetors. To the right is his White steamer. Mother's Day weekend always marks the start of the touring season for the Cook family. We have been going to "Amish Country" in our Model T since the car has been restored. We always tour with a group of good friends that can have fun under any circumstance. The photo to the right is a good example. We had to stop along the road because one of the sedans was having electrical problems. 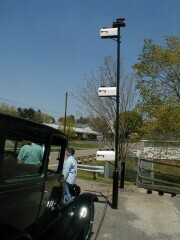 And there sat this multi-leveled Amish mailbox. The bottom is regular mail, the top is airmail, and the one in between is for the IRS. I believe the "lady" in the picture is Nancy Mize, Brent's wife. On May 20th, the American Society of Mechanical Engineers held an event at the Henry Ford Complex (formerly Greenfield Village). They had picked Henry Ford's assembly line as one of the most important engineering feats in the last 100 years (they also were honoring the ball point pen). 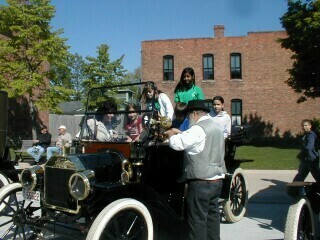 Over forty Model T's were invited to attend the event for display and education. "Old Henry" my 1916 represented our club quite well. He performed flawlessly and didn't leak gas like some of the pretty cars that were sitting on the street. The pictures are both of Bud DeLong, one of my Michigan buddies that I always look up when I'm around the village. The top picture shows Bud allowing kids into his 1914 for a little show and tell. They all got to honk the horn. We do the same with "Old Henry"; but, you can't honk a magneto horn unless the car is running. The second picture was taken during the ride through the village. 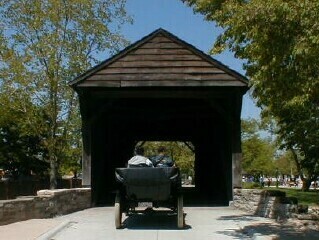 We just happened to be following Bud; so, My wife Sue took the opportunity to snap a shot of him driving into the covered bridge. 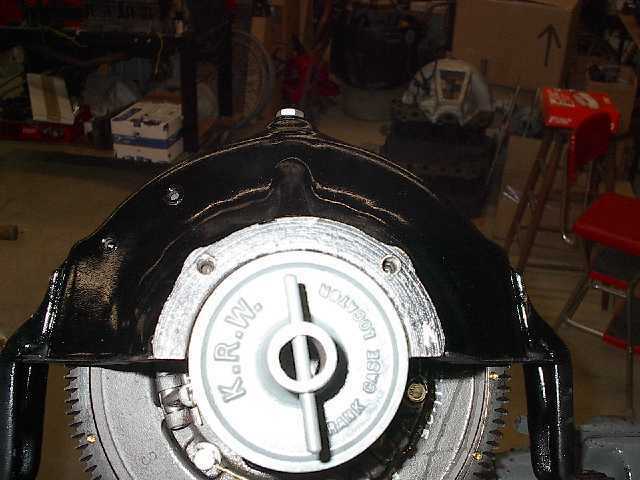 These pictures show the problem that exists in many Model T crankcases. A case in point was the group of T-100 engines that were in recently for rework as the result of this problem. The tail end of the pan wants to bow down to meet the drive shaft. 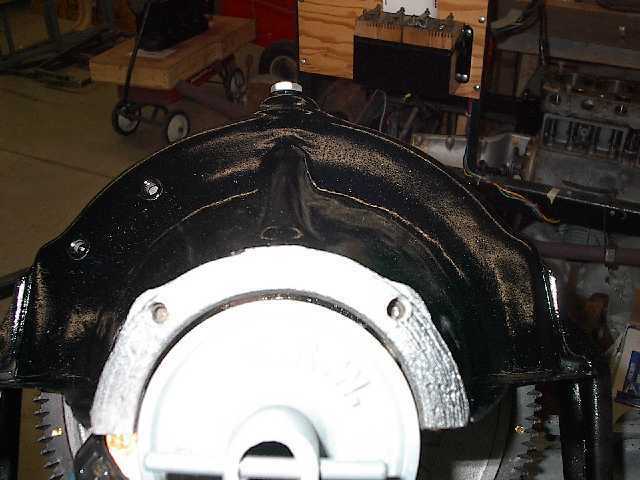 The crankcase in question "was previously staightened by a well know individual to the Model T hobby". You can see the problem, and if left unchecked, it would surely have caused crankshaft failure. 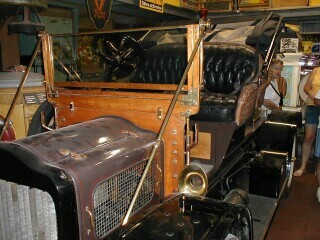 Knowing how to recognize problems with the Model T is half of the battle. Large camps solve the other half. The first couple of photos show the dropped rear section of the pan as shown by the KR Wilson fixture and by the 4 foot level. In the last picture you will see that the problem has been solved! Notice that the KR Wilson fixture fits neatly into the semi-circle now. It took and additional 6 hours to rectify this situation and get back to work on the engine building. Of course there was a lunch break in there. 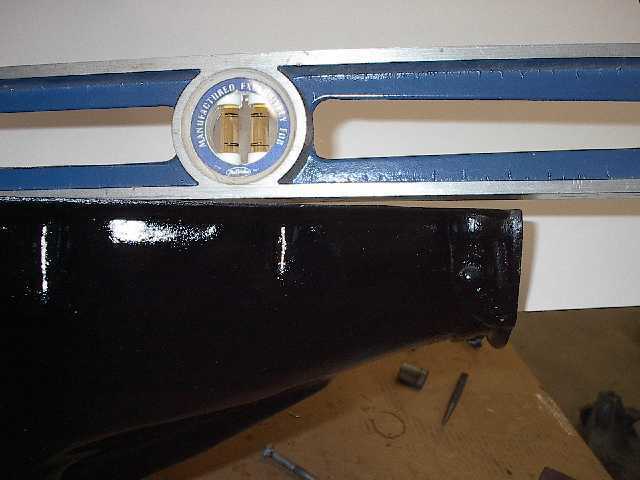 In the next issue, there will be the story of a one day turnaround on a 1926 engine w/new bearing pour and also an article on holding the bands together during a hogshead-band-change.